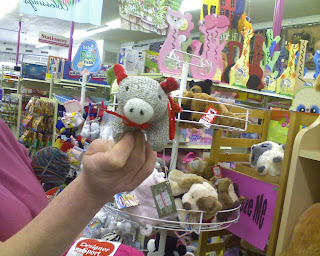 i had to repost my sprout blog, cause i am still essentially computer illiterate, and deleted the last one. i mean deleted, as in had to reshoot the photos and all. these are sent from my phone, and i have no control over the order in which they publish, so if this post seems all mixed up, consider the source! above is the finished product after 2 days of sprouting. 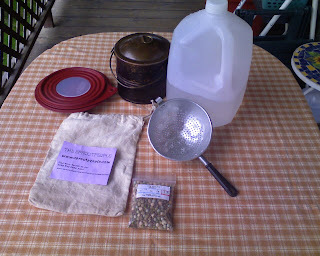 a hemp sprout bag, a collapsible tupperware bowl, my copper cook pot, an old mini strainer, water, and seeds. 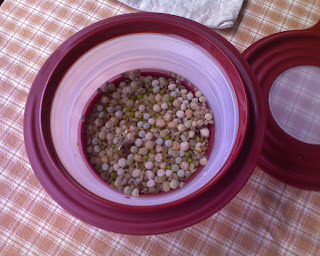 the seeds are an organic stir-fry mix that i picked up in port angeles last summer at sweet mike's. they are crunchy and just a bit spicy! i ate them right out of the hemp bag....after sprouting, of course. 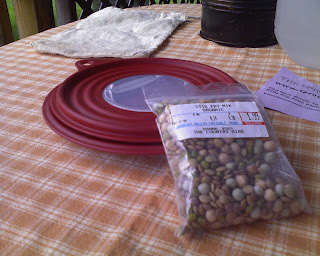 and seed soaking bowls! 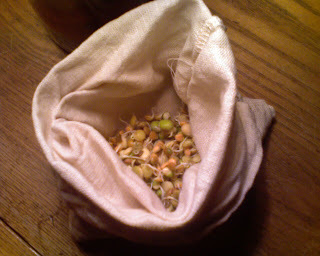 these seeds were soaked overnight, then placed into the hemp bag, which was thoroughly soaked with water. at home i would have hung the bag over the sink. 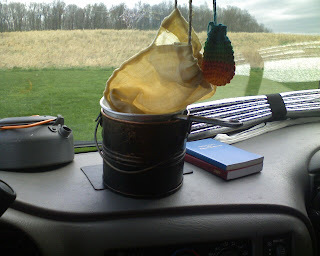 in the van, i used a mini strainer i found in my mom's stuff, which just happened to fit perfectly into my copper pot, as a place to allow the initial drainage of water from the bag. see how perfect it fit? 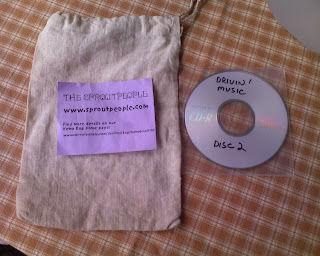 here it sits on my dashboard, the bag hung from the rearview mirror. after all the dripping is done, i can hang it from a cuphook on my cupboard where it will get good air circulation. when the bag begins to dry out, rinse and repeat. your climate (humidity, temps, breezes, etc. will affect how often you need to rinse the bag. just make sure the seeds stay moist. these are my cookpots. the hae tea kettle by GSI is lightweight and sturdy and perfect for heating a couple cups of water for tea or oatmeal or ramen. 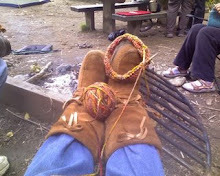 the copper boiler is a heavy but beloved rendezvous pot....as you can see it has seen alot of campfires. i can still smell the aroma of a smokey fire faintly when i heat it up :-) it holds water enough for a 2 packet ramen stew with salmon and veggies. a little harder to clean, because of the historically correct little rings around the middle, but worth the extra effort. my frying pans are the Banks Fry-Bake pans which double as ovens. the smaller alpine model is pictured, and will cook a small batch of cinnamon rolls, or a small omelet. the larger model (not pictured) will do a big batch of biscuits or stir-fry for a couple people. on the left is the riser, or scorch buster. 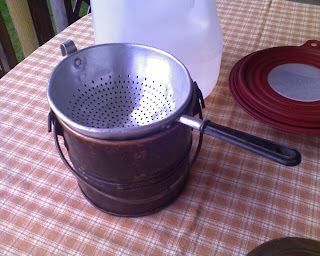 i will be doing a seperate blog on the fry-bake pans with some cooking experiments. i had an 8" nonstick frying pan by GSI with a folding handle that i just removed in my ruthless gear purge last week after returning from the west coast. i fully intend to keep it from creeping back in. we'll see. eating stuff.....MSR alpine plates which are smaller, sturdier and pack flatter. an insulated mug big enough for tea, cup-a-soup, 2 packs of oatmeal, or 1 pack of ramen. my hand thrown mug/bowl made by a friend at rendezvous. i have several of her pieces. they are heavy and don't pack well, but i love eating out of this bowl, so it stays. for now. the rubbermaid bowl is one of those that packs flat, and comes in handy for many things. i use this one for salads or a mixing bowl, and as a small dishpan on a rare occasion. i use backpacking utensils mostly. the gadget with the blue handles is my pot lifter that safely grabs handleless pots and pans. you recognize the can opener. the black thing in the upper left hand corner is an MSR folding spoon. it works for stirring, ladeling, and even measuring....inside lines mark off tablespoons and partial cup measurements. 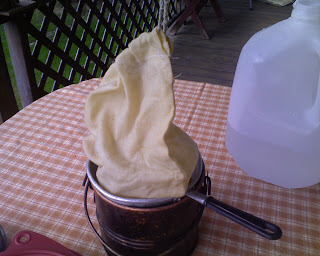 some backpacking recipes are written according to numbers of "MSR spoonsful". a spatula, extending roasting forks, and a mini extendable blowpipe complete the set. no Ron, not weapon type blowpipes.....this is for blowing a stream of air at the base of your fire so you don't catch your cowboy hat on fire. igloo water cooler....keeps ice for several days....holds 1 gallon of water and 1 bag of ice. the rubbermaid narrow refrigerator bottle fits the shelf next to the igloo and holds 1 1/2 gallon. my butane stove on pull out shelf. i traded 6 smaller plastic drawers for two larger ones after extreme downsizing. 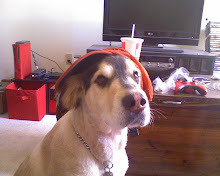 my hope will be to lower the bed somewhat to prevent knocking my noggin on a daily basis. my old paper towel holder....a mini plunger that fit into the cup holder in back. i can now reclaim the cup holder, and have one roll of paper towels accessible from the front or back. so comments would be appreciated if you liked this pictorial essay....i will do more on other gear!